Figure 1. This bluish green chalcedony, colored by chromium and nickel, is marketed under the trade name “Aquaprase.” Credit: Kevin Schumacher. A new type of chalcedony (figure 1) was recently submitted to GIA’s Carlsbad laboratory by Yianni Melas of Greece. According to Melas, this material originated in Africa (figure 2), although a more precise location has not been made available. The translucent material displayed a vibrant bluish green color and is currently marketed under the trade name “Aquaprase.” Although chalcedony varieties such as chrysoprase and Gem Silica are well known and occur in yellowish green and greenish blue colors, the color of this material was distinctly different from any African chalcedony examined by GIA to date. From a gemological perspective, it was important to conclusively determine that this material was naturally colored and not artificially dyed. Since the quartz crystals present in this material were colorless rather than brown, we ruled irradiation out as a possible treatment. Microscopic examination of rough and cut stones in conjunction with chemical analysis and visible spectroscopy were used to characterize this chalcedony. Standard gemological testing revealed an RI range from 1.531 to 1.539, with no observable birefringence. The SG, measured hydrostatically, ranged from 2.55 to 2.57. A handheld spectroscope revealed faint, narrow lines in the red end of the spectrum, rather than the broadband absorption one would expect if the material had been dyed with an organic pigment. All of these features were consistent with natural-color chalcedony. Microscopic examination revealed a granular aggregate structure with a few areas showing subtle banding and faint green concentrations of color between some of the coarser quartz grains, which appeared to be a greenish mineral phase located along the grain boundaries. A waxy luster was observed on fractured areas, consistent with an aggregate material. Some areas contained small cavities that were filled with colorless drusy quartz crystals (figure 3, left and center). Dark brown and black inclusions of various metal oxides were also observed scattered throughout most of the samples examined, along with some areas of whitish cloudy inclusions that were not identified (figure 3, right). Raman analysis confirmed the material was quartz. EDXRF was used to analyze the trace-element metals that might be responsible for the bluish green color. All seven finished gemstones tested showed the presence of chromium and nickel. Interestingly, iron, vanadium, and copper were also detected in one of the cut samples, but these elements might not be related to the color, as other bluish green samples did not contain them. 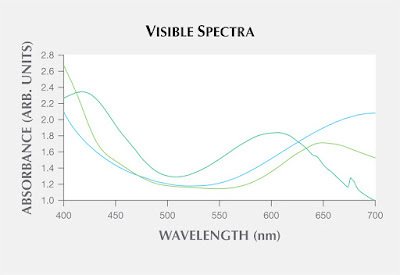 Visible spectroscopy (figure 4) revealed broad absorption bands centered at approximately 420 and 600 nm, with a large transmission window at approximately 500 nm producing the bluish green color. Sharp absorption peaks at 646, 676, and 679 nm were presumably related to chromium. 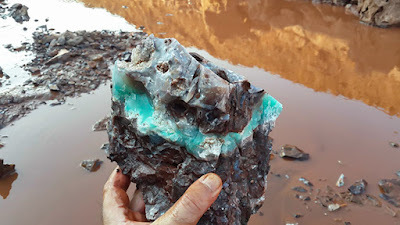 This new type of African chalcedony is easily recognized by its unique composition and absorption spectrum, which is significantly different from the chrysoprase and Gem Silica varieties. The attractive bluish green color of Aquaprase, which may be caused by chromium and nickel, should prove to be a popular and welcome addition to the gem trade. Figure 2. A large piece of chalcedony rough recovered from the mining area. Photo by Yianni Melas. Figure 3. The Aquaprase samples contained minute pockets of colorless drusy quartz (left and center) and irregular brown and black metal oxide inclusions (right). Photomicrographs by Nathan Renfro; field of view 2.83 mm (left), 4.76 mm (center), and 4.62 mm (right). Figure 4. The visible spectrum for the Aquaprase (bluish green trace) showed two broad absorption bands at 420 and 600 nm in addition to sharper peaks at 646, 676, and 679 nm. This absorption pattern is clearly different from that of chrysoprase (yellowish green trace) and Gem Silica (greenish blue trace). Natural-Colored Chrome Chalcedony Identified Using Laser Ablation–Inductively Coupled Plasma–Mass Spectrometry (LA-ICP-MS). A report on the use of trace-element LA-ICP-MS analysis to determine the coloring agent (natural or artificial) of chrome chalcedony. Download PDF to view. Note: The above post is reprinted from materials provided by Gemological Institute of America Inc. The original article was written by Nathan Renfro .